The CyberPower P705G is a commercial and residential surge protector for personal computers, large flat screen TVs, printers, speakers, scanners and home electronics. 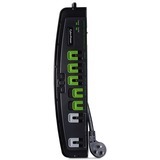 It offers seven (7) total surge protected outlets and four (4) Energy-Saving outlets designed to turn off up to four connected devices when your TV or PC is shut down or goes into standby mode. The Energy-Saving Threshold Switch keeps the energy-saving feature active when the Master Outlet detects low power consumption. The P705G features 2100 Joules of protection and metal oxide varistor (MOV) technology, which guards the surge suppressor and connected electronics against line abnormalities and lightning surges. EMI/RFI filters block unwanted line noise from all connected electronics. Our Flame Resistant Technology uses an ABS housing that provides a high level of protection (UL 94 Recognized V-0 class material). A Limited Lifetime Warranty ensures that this surge suppressor has passed our highest quality standards.